Meanwhile, things were happening in the Foss family which had not tended to make the position of the "hired boy" more agreeable. Arabel, the eldest daughter, who sympathized with Orison's aspirations, had very decided ambitions of her own. She had taught several terms in a district school, and, with what she had saved out of her salary and what she had made by picking and selling berries, had enough money to pay for a term in school either in Boston or at the Academy in New Hampton. But her father absolutely refused to let her go. He flew into such a rage when she first brought up the subject that she had to drop it. The girl did not, however, relinquish her determination to go to school; she decided to go without his consent. When her plans were matured, Arabel made Orison her confidant. She told him that she had arranged to go to New Hampton and asked him to accompany her to the railroad station the following evening, after supper. Although dreading what would happen when her father discovered her flight, Orison agreed to do what he could to help her. When Arabel's absence was discovered the next morning, the scene that followed was more terrible than anything the boy had pictured. Mr. Foss's anger made him for the time a madman, capable of any desperate deed. Suspecting Orison's complicity in his daughter's disappearance, he at once rushed at him. The boy's lightness and fleetness of foot enabled him to dodge his assailant, and he escaped from the house. Fearing that the man might do him some serious bodily injury, he fled to the mill as fast as his feet would carry him. Once there he began to work, turning bobbins, expecting every moment to see his employer enter. In a little while Mr. Foss appeared, and, his rage still at white heat, he stopped the machinery of the mill and called to the boy to come from behind the lathe. A man named Durgin, who had been working with the boy, interfered. He did not know what the trouble was, but being familiar with Foss's ungovernable temper, and, seeing that the latter would not be responsible for anything he did in the mood he was in, Durgin stepped between him and Orison. Foss then stooped down, and, picking up a block of bobbin wood from the floor, tried to throw it at the boy. Durgin caught his arm and warned him that if he attempted to injure the lad, he would knock him down. After a while Foss's rage subsided. Orison and Durgin set the machinery of the mill going again and went on with their work. But after that Orison knew that he must lose no time in getting away from Foss. The man cherished a grudge against him — in fact, blamed him for his daughter's act — and he could not feel safe in his house. "Every youth owes it to himself and to the world to make the most possible out of the stuff that is in him." He could not tell what would happen the next time Foss fell into one of his rages. Orison therefore began casting about for another job, and meanwhile continued in much trepidation and agony of spirit, to work at the Foss mill and on the farm. Then Fate again intervened and took a hand in shaping his future. A few days after Foss's attack upon him at the mill, an accident occurred there which took him away from it forever. "I had gone to the mill about five o'clock in the morning," he says, "to saw up some white birch blocks for bobbins. When the first block was nearly sawed and I was trying to hold the ends of both sides of the saw, the block slipped and my right hand struck the saw. I pulled my hand away as quickly as possible, but not before I had received a bad wound. The thumb was nearly cut off and dangled from the hand by shreds of skin and flesh." "Several arteries had been cut, and my first effort was to stop the flow of blood. Being alone, I managed with my left hand to tie a bandage about my wrist as tightly as possible, and then, closing down the mill, went to the house as quickly as I could." "The nearest physician was more than three miles away, and I was so weak from loss of blood when he came that he did not think it best to amputate the thumb. He said, however, that it was absolutely impossible to save it, but that he would let me rest until morning." "Unless you are prepared yourself to profit by your chance, the opportunity will only make you ridiculous. A great occasion is valuable to you in proportion as you have educated yourself to make use of it." "When he came in the morning he wanted to give me chloroform because, he said, he would be obliged to amputate the thumb. I positively refused to take anything, or to let him touch the thumb. He protested, however, that the second joint was so crushed and mangled that he would be obliged to remove the splinters of bone. To this I assented, but refused to take the chloroform, and held out my hand without assistance while he removed the several pieces of bone from the joint." This accident rendered his thumb practically useless, and thereafter hampered him in using his pen. But it had an effect far beyond its physical inconvenience, in bringing his mind to a focus on the desirability of an education, and on the ways and means of getting it. When he was able to use his hand again, the youth went to a neighboring farmer, and, explaining his situation, asked if he would not give him a place on his farm temporarily, without wages, until he could find something else to do. The farmer agreed to do this, and Orison at once removed himself and his scant belongings from the Foss household to his new home. During the scant time he had attended school, while working for Foss and the others to whom he had been bound out, he had learned little more than the three R's. He longed for better and more advanced instruction than the remote district schools of New Hampshire afforded. 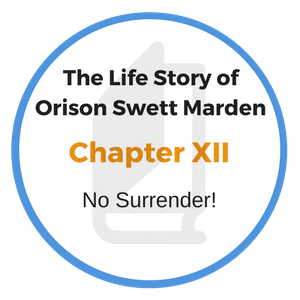 With the object of securing such an opportunity, young Marden walked many miles to the home of his guardian in order to have a personal interview with him. The youth was advancing in his teens and felt that now or never he must forge ahead. To his great joy his interview with his guardian proved, in a measure, successful. By persuasion he succeeded in winning his permission to attend Colby Academy, a preparatory school in New London, New Hampshire, for at least one term. That was enough for the present. He could scarcely contain his delight. Everything else was forgotten in the wonderful prospect his imagination saw opening before him. What mattered is that neither his guardian nor his wife could even understand his desire for higher education, that they discouraged his ambitions and had little faith in his ability to make his dreams come true? How could those frugal-souled, unimaginative people know of the vision that lived in the boy's mind? What did they know of Samuel Smiles's "Self Help" — of the hopes and ideals and enthusiasms it had stirred to life in him? And what cared he about such foolish taunts as, "You'll never amount to a hill of beans, anyway!" Sensitive as he was by nature, he was too well used to abuse and slighting personal remarks, to allow them to disturb his faith in himself. "To hear that I never would amount to anything was no new thing for me," he said. "In the five different places in which I had been bound out to service since my father's death, it had been constantly said to my face that I was 'a good-for-nothing,' that I would never amount to anything, and that all I was good for was to do the commonest kind of work. In fact, the suggestion of my inferiority was so impressed upon me in my boyhood, that it was difficult for me in after years to overcome it. The unfortunate suggestion seemed to be ingrained in the very marrow of my being, for all through the different stages of my career I used to be amazed at my successive promotions." "Could it be that the ‘good for nothing’ boy who had been told so often that there was no chance for anyone like him, away back in the woods, without friends or money, ever to do anything but work on a farm, or in a saw-mill in the forest — could it be that he was, in a measure, after all, succeeding in doing something he had longed to do — something he liked better than sawing wood, picking stones, milking cows, plowing, or pitching hay?" "Every germ of goodness will at last struggle into bloom and fruitage... true success follows every right step." His experience in finding different ways for earning a little money when trying to recover his dog Ring from Farmer Webber had proved helpful, not only in increasing his resourcefulness and his ability to earn, but also in building up his self-confidence. 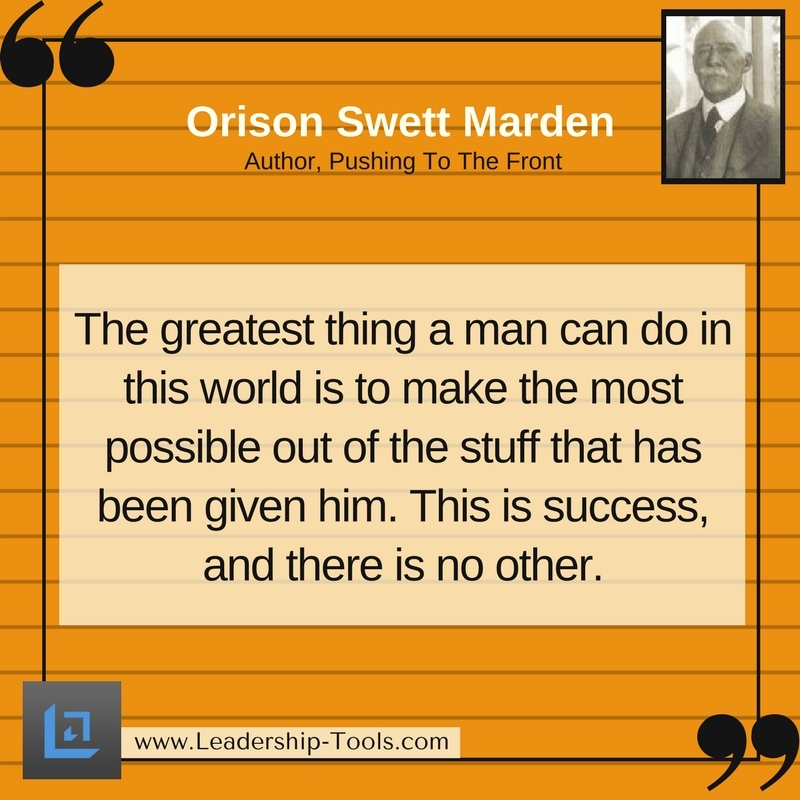 Moreover, the lessons learned from "Self Help" had sharpened his wits as well as his ambition. It heartened him to think that, a short time after reading Smiles's book, he had, by way of extra hard work and the most rigid economy, managed to scrape together two dollars — every cent of which he had spent in the purchase of a large blank notebook and some pencils. taking your measure for a larger place." He would make this a great occasion. 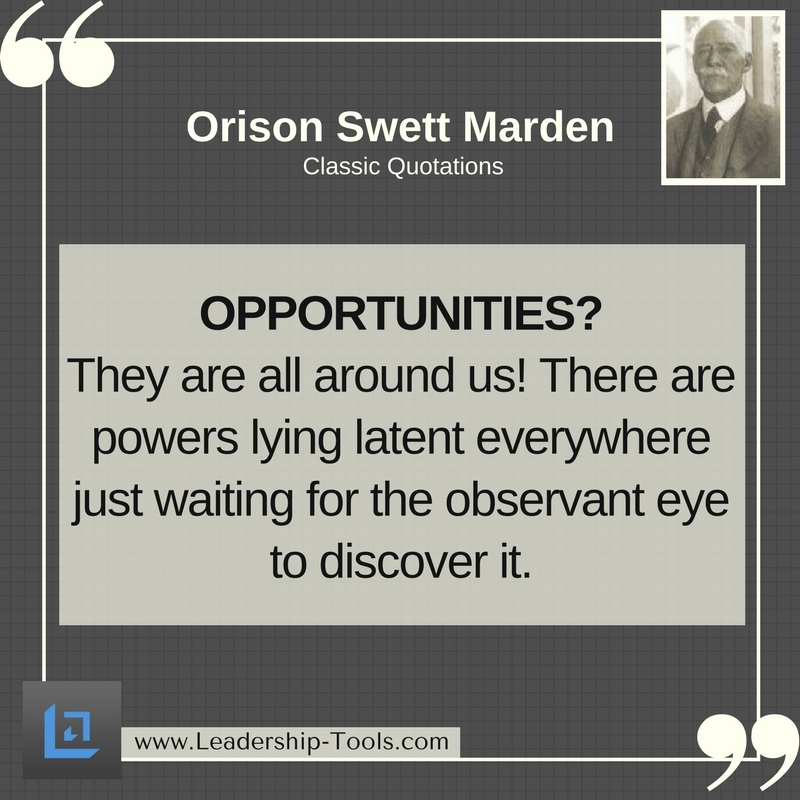 Even one term at an academy would open the door to larger opportunities. He already saw himself forging ahead into the great open spaces of life that stretched beyond the horizon of his native hills. So, with hope singing in his heart, the youth worked with a will through the intervening Summer months, and in the autumn was ready to make his start in pursuit of knowledge. 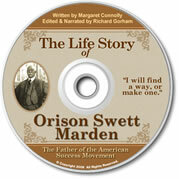 When you purchase The Life Story of Orison Swett Marden audiobook, you also receive a free ebook version of this inspiring classic. Listening to audio books are the perfect solution for the busy leader. It's easy to learn and grow by listening to inspiring audio books during your morning and afternoon commute; when working out at the gym or hiking outdoors. Incorporate leadership audio books into your normal routine and make the most of each and every day.